Note: Fans of Coldcut can also make their own versions of 'Whistle & A Prayer' and 'Walk A Mile' on YourSpins.com. It's free, you don't have to download anything and its more fun than writing on the sole of your slipper with a biro. 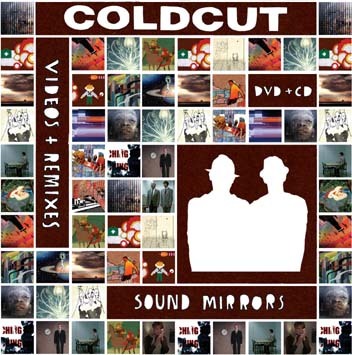 Coldcut have always been fascinated with the fusion of music and visual and so the idea of them curating an art project of Sound Mirrors (their stunning and critically acclaimed album) was a fitting one. In collaboration with freelance music video commissioner Vez they set about taking the medium of the music video out of the commercial realm and directly in to the heart and soul, making the work a wholly artistic expression of the music. Individual video directors were specifically invited to add their creativity to a song, visually interpreting the track in their own unique way. 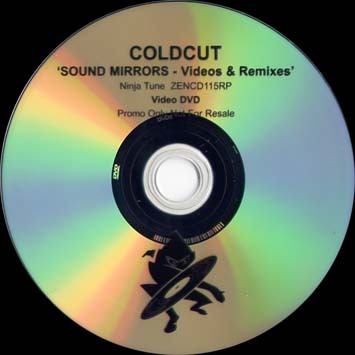 There was no brief, no pitching against other directors, it was to be their creativity under the spotlight and just one constant - they all had to work to the same budget and if possible Coldcut were not to feature in the work. It's all about taking the director out of the realm of painter for hire and giving them the creative recognition they so hugely deserve. This is not only in the creative brief but in how they are presented on the DVD and how their fee is an advance against royalites - the same as if they were a guest musician – it's an exciting and bold move. The outcome is a stunningly diverse collection of highly creative music videos directed by a range of different directors from the famous to the unknown. "This has been a really exciting project," comments Jon More. "Putting your trust in and giving the video directors an open brief is a leap of faith but I think the results show…the breadth of ideas and techniques are incredible. I think this shows that treating the directors as artists rather than hired hands has produced a much stronger and unique package." Matt Black adds "These videos are reflections themselves, visual echoes of our music as seen through the eyes and ears of the collaborating directors. Feeding back their responses let's Coldcut uncover a bit more about our own motivations and meanings within Sound Mirrors. Some surprises there. We can take this work on and assemble elements from the videos into our AV live show. As happened in music, technology and the DIY attitude are fast combining to change the world of pop promos. We want this DVD to be a signpost for that: an encouragement to redefine not only the relationship of director to record company and artist, but the form itself." 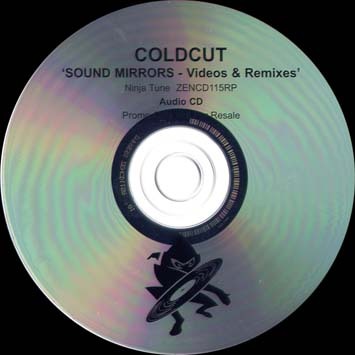 The flipside of this release is an audio CD collection of remixes of the singles taken from Sound Mirrors, as well as additional remixes of a bonus track "The State We're In" and the Coldcut classic, "People Hold On". 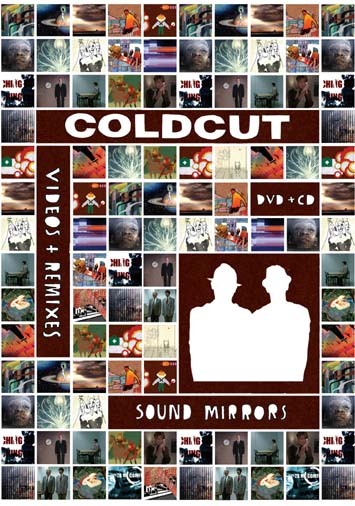 A must for any Coldcut fan. Fans of Coldcut can also make their own versions of 'Whistle & A Prayer' and 'Walk A Mile' on YourSpins.com. It's free, you don't have to download anything and its more fun than writing on the sole of your slipper with a biro. Thanks, your message are added in the home.